Celebrating one of the most dynamic and versatile actors today, the Gene Siskel Film Center (GSFC) of the School of the Art Institute of Chicago honored Golden Globe, Tony, BAFTA and two-time Academy-Award winner Kevin Spacey, at the Four Seasons Chicago (120 E. Delaware Pl.). “Kevin Spacey: Renaissance Man” paid tribute to the actor’s accomplishments on the screen as well as gave attendees the opportunity to hear an intimate conversation, providing insights into his creative process and influences, favorite roles, upcoming projects and more. A retrospective of film clips from some of his most memorable performances accompanied the conversation highlighting his illustrious career. The evening culminated with the presentation of the Gene Siskel Film Center Renaissance Award to Spacey by SAIC President Elissa Tenny and GSFC Advisory Board Chair Ellen Sandor. Actor Jeremy Piven joined the actor on the red carpet. WHAT: Carrie Lannon will share her expertise in marketing best-in-class companies and executive coaching to reveal the how-tos of creating and building a personal brand. Carrie leveraged her own personal brand to win public relations clients including Tiffany & Co, Mercedes-Benz, Ferragamo, W Hotels and more. She explains how a strong personal brand can impact how others think about you and move you towards achieving your goals. Carrie will provide step-by-step directions and a quiz for audience members to discover their own unique personal brand. EXTRA: Carrie’s presentation will be followed by a panel discussion with top Chicago-based influencers Ryan Beshel, Kirsten Miccoli and John Philp Thompson. HOST: Fashion Group International is a global organization dedicated to promoting the advancement of both new and seasoned professionals in the fashion industries: apparel, accessories, retail and home. and Sophia Wong Boccio (Director of Asian Pop Up Cinema). Asian Pop-Up Cinema presented a Lifetime Achievement Award to Hong Kong Godfather of Rock N Roll Teddy Robin Kwon on May 11th for his achievements in music and film. The award was presented to Kwan by Chicago Film Office’s Rich Moskal on behalf of Asian Pop-Up Cinema Director, Sophia Wong Boccio. The Awards Ceremony will be at the Chicago History Museum, 1601 N. Clark Street at 5:30pm. Fulcrum Point New Music Project headline dthe evening with a multi-media musical performance of Kwan’s award-winning scores. The festivals Cantonese singing contest winners also performed three of his theme songs that stayed at the top of the Cantopop music charts and greatly influenced people in Hong Kong and China at the time: Cops and Robbers (1973); Till Death Do We Scare (1982) and City on Fire (1987). Teddy’s co-composer from Hong Kong, Tomy Wai – with 74 music-for-movie credits to his name – will be joining Teddy as a guest speaker. In advance of the Award Ceremony Night, two of Teddy Robin Kwan’s films were presented for free: SHE REMEMEBERS, HE FORGETS, which he produced, (Tuesday, April 25th at PianoForte, 1335 S. Michigan Ave. at 7:00pm); and GALLANTS, where he won a Hong Kong Film Award for Best Supporting Actor and was nominated for Best Original Score (Friday, April 28th at Joffrey Tower, Studio A, 10 E. Randolph St. at 7:00pm). Both films will be shown in Cantonese with English Subtitles. Teddy Robin Kwan is known as the Godfather of Hong Kong Rock ‘N’ Roll. He’s an English pop singer-songwriter and Hong Kong actor, director and producer. In the 60s when Hong Kong English pop was at its peak, Teddy was on top of the charts with his band Teddy Robin and the Playboys. He later became an actor, film director, producer and composer. He acted in 24 motion pictures, directed four –and was nominated for one as Best Director. His musical career spans over 30 years, with over 24 songs written for movies – and many that were nominated for Best Original Film Score by The Hong Kong Film Awards. Hosted by the Governing Board of Directors of SOPHIA’S CHOICE, the Award Ceremony Night is presented in association with the Hong Kong Economic and Trade Office, New York and sponsored in part by the ADG Group; Hing Kee Restaurant; The Whitehall Hotel; City Winery Chicago; and Garrett Popcorn Shops. Net proceeds from ticket sales will benefit the year-round general operating expenses of Asian Pop-Up Cinema. The Hong Kong Economic and Trade Office in New York is the representative office of the Hong Kong Special Administrative Region Government. In 2016, the New York ETO promoted a better understanding of Hong Kong as a vibrant international financial, trading, educational and arts and cultural hub by reaching out to the business community, political and government leaders, and arts and cultural institutions in the Eastern US, including 24 visits to 20 states. Several film festivals were held in New York City and Chicago. Follow HKETO NY on Facebook: “Hong Kong Meets America” and for more information: http://www.hketony.gov.hk /ny/index.htm. Pictured above: Teddy Robin Kwan,Steve Barclay,director of the Hong Kong Economic Trade Office and his music composer Tomy Wai . Photo © Linda Matlow/PIXINTL. All rights reserved. I am very proud to present a very small edition of my poem about the essence of woman as the perfect gift for Mother's Day. 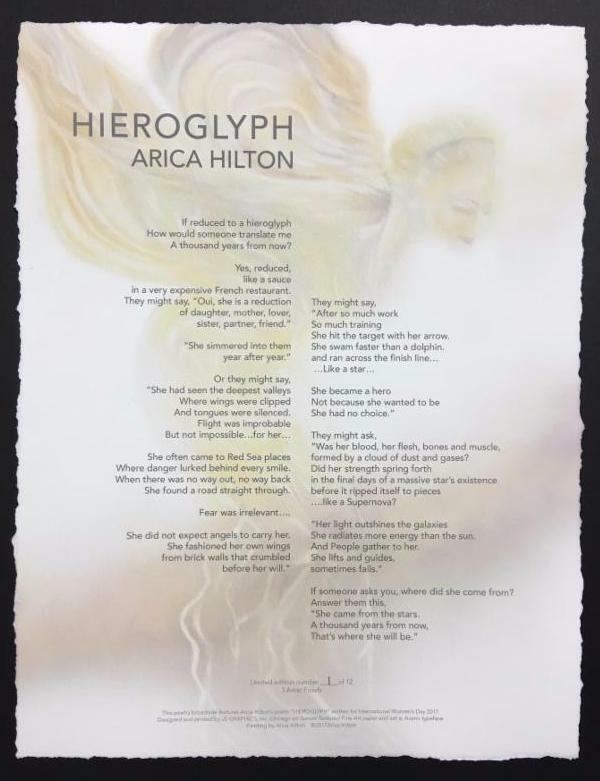 This poem has been reproduced as a limited edition poetry print (a broadside) with the image of my Spirit of Ecstasy painting in an edition size of 12 pieces. A "broadside" is a poetry print that was born from an art form dating back to the 17th century. Originally, broadsides were printed as a political statement or opinion to be distributed to the citizenry, the most famous of which were the Dunlap Broadsides, the first published copies of the Declaration of Independence. This tradition led to printing poems from the oral tradition of the ballad. Today's broadsides are often illustrated by an artist, and signed and numbered by both the poet and the artist. I am very proud to offer my first ever broadside. If you place an order by Thursday, delivery is guaranteed anywhere in the country before Mother's Day. Please click on the link above. Feel free to call me with any questions at 312.852.8200. Chicago City Markets open for the summer season on Thursday, May 11, at Daley Plaza and on Sunday, May 14, at Maxwell Street Market. Join us! Following its hugely successful run at the National Theatre, “NT LIVE: Peter Pan” hits cinemas nationwide for a special one-day event. Directed by Sally Cookson and co-produced by Bristol Old Vic, the wondrously inventive production of JM Barrie’s cherished tale will be shown at 11:00 a.m. local time on Sunday, June 11, 2017, from Fathom Events, BY Experience and National Theatre Live. When Peter Pan, leader of the Lost Boys, loses his shadow, headstrong Wendy (Madeleine Worrall, Jane Eyre) helps him to reattach it. In return, she is invited to Neverland, where Tinker Bell the fairy, Tiger Lily and the vengeful Captain Hook (Anna Francolini, wonder.land) await. Tickets for “NT LIVE: Peter Pan” can be purchased online by visiting www.FathomEvents.com or at participating theater box offices. Fans throughout the U.S. will be able to enjoy the event in more than 300 select movie theaters. For a complete list of theater locations visit the Fathom Events website (theaters and participants are subject to change). BY Experience kicked off the digital revolution of live events to movie theaters and other locations globally with David Bowie’s 2003 Reality album launch and since then, over 30 million tickets have been sold worldwide for cinema events BY Experience has distributed globally. Current cinema series credits: Distribution Representative, The Met: Live in HD (Worldwide; since 2006), the UK’s National Theatre Live (Ex-UK; since 2009), Bolshoi Ballet (North America; since 2014). BY Experience has executive produced and/or distributed several diverse programs for cinema including numerous rock concerts, radio programs, fine art exhibits other special content events including national theatrical re-releases of classic and in some cases fully restored films such as “The Breakfast Club” (30th anniversary), “My Fair Lady” (50th), “Oklahoma!” (60th), and “Fantasia” (75th). BY Experience distributes to over 70 countries, to over 3,000 movie screens. www.byexperience.net. National Theatre Live launched in June 2009 with a broadcast of the National Theatre production of Phèdre with Helen Mirren. The company has since broadcast more than 50 other productions live, from both the National Theatre and from other theatres in the UK. NT Live broadcasts have now been experienced by over 6.5 million people in over 2,500 venues around the world, including over 700 venues in the UK alone. Past broadcasts from the National Theatre have included Danny Boyle’s Frankenstein with Benedict Cumberbatch and Jonny Lee Miller; War Horse; Man and Superman with Ralph Fiennes; and most recently Twelfth Night with Tamsin Greig. Broadcasts from other UK theatres include Les Liaisons Dangereuses and Coriolanus fro m the Donmar Warehouse; A View from the Bridge from the Young Vic; Macbeth from the Manchester International Festival; and Hangmen, Skylight, The Audience and No Man’s Land from London’s West End. The biggest single broadcast to date is Hamlet with Benedict Cumberbatch at the Barbican, which has been seen by over 600,000 people. In 2014 the National Theatre recorded its first production on Broadway, Of Mice and Men with James Franco and Chris O’Dowd, captured at the Longacre Theatre.